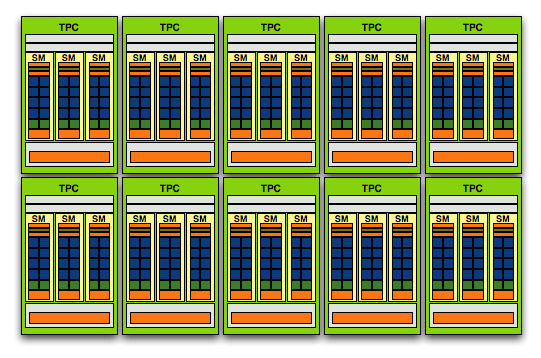 FANTASTIC write up on fine-grained TMT. I was unaware about this threading technique and was always thinking of this in class or whenever someone would talk about hyperthreading. this technique was literaly in my head for well over a year and I didn't know what it was called or that it even had a name. 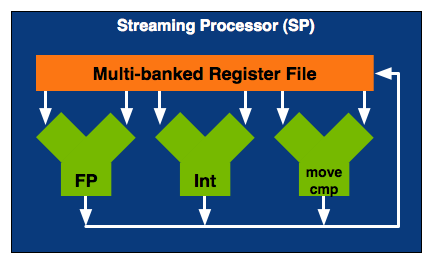 I always thought there had to be a more elegant way than hyperthreading to do multithreading down at the chip level without doing the OS style time slicing. remember though that this type of fine-grained TMT only has payoffs in systems running millions of threads concurrently. on an OS you'll see hundreds or even thousands of threads on heavily used systems, but there still wouldn't be enough concurrent action to justify this type of architecture for general purpose computing. 1) Last week at WWDC Apple announced OpenCL as an alternative to CUDA. 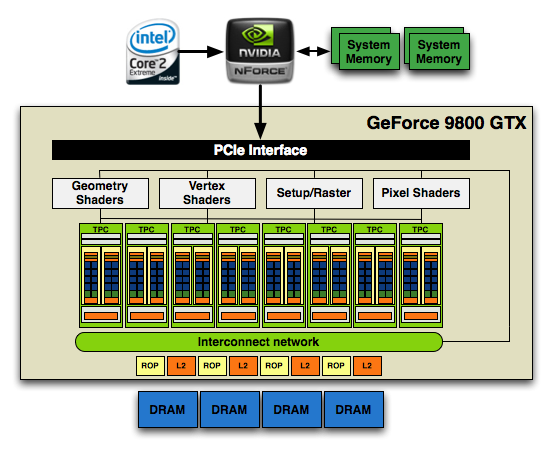 It's a C99 based HLL for creating compute kernels that can be deployed to GPU's and CPU's. Today Khronos officially announced a working group for this, and NV is a part of the committee. As such, your wish for an industry standardized compute language similar to CUDA that runs on all platforms and vendors HW may not be so far off. 2) I believe your interpretation of how multiple threads simultaneously execute in an SM is incorrect. Per thread context switching is not free, and you would never be able to execute a different thread every cycle in the manner described. There is far too much context that needs to be swapped out, and there would be significant power implications for doing that, in addition to the latency. Instead, I believe what NV is claiming is that any given SP executes a single thread. All threads in the SM can all be a single warp, but you can also have multiple threads (one per SP) all executing simultaneously in an SM. 2) it does not context switch per thread -- warps define a context, and you have 32 threads grouped together. these threads all share the same instruction stream, which is why if threads in a warp take different directions on a branch all 32 threds must follow both paths. 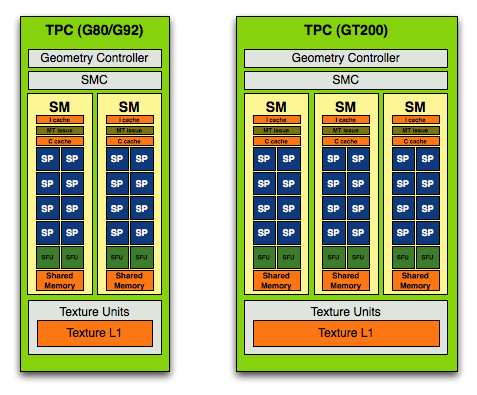 NVIDIA has flat out stated that every schedule clock a new warp is scheduled and that it takes 4 clock cycles to process one warp on an SM. For both of these to be true, we conclude that the scheduler alternates scheduling SPs and SFUs on altenating clocks which means the SPs would be scheduled every 4 clocks relative to itself. 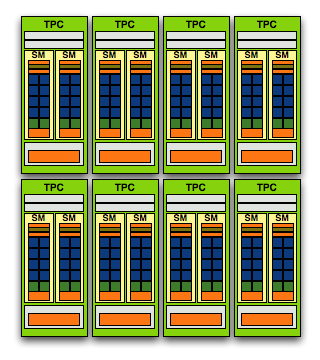 On 8 SPs per SM, you some how need to execute 32 threads in 4 clock cycles. This makes sense if you execute 4 threads per SP in some way. The details at this point are fuzzy though. From this conclusion, Amd seems to be the shrewd player, let nvidia and intel duke it out in the high voltage, heat, meaningless speed gpu while Amd can pull something like its first dualcore or athlon64 for the win. this new beast from Nvidia will have how many developers making games for it right away? i'm guestimating maybe 2yrs-4yrs down the road we'll see a decent title that take full advantage of this hardware. by then Amd will have something of a midrange that can more than handle the games. 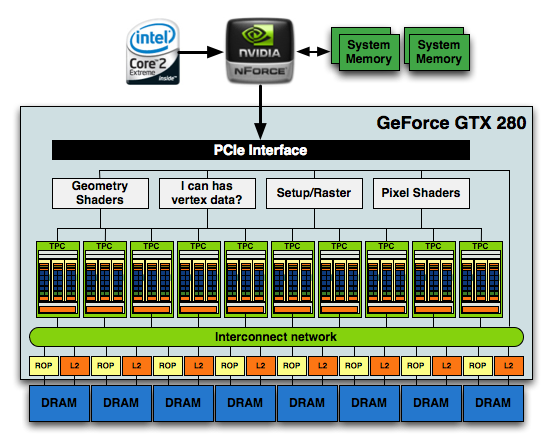 2 things nvidia could work on that it already has, the ps3 market, and small graphic devices to improve profits. shrink the ps3 gpu further so Sony can shrink it's machinel and sell more. The GT200 core may be a technical masterpeice in terms of actually making something that big which is fully functional on GTX280 cards, but it seems to me the penalty of fabbing it at 65nm negates much of the benefits of such a wide GPU. They've had to drop the clock speeds throughout presumably because of the ridiculous amount of heat such a large core generates, which means the ~60% performance advantage in current games over the G80 core at similar clock-speeds is somewhat reduced. the only game that came close to having this issue with quad sli for us was oblivion. in that game at high res lag and stutter are unbearable and the game is unplayable. we didn't notice any stuttering issues with a single GX2. I find it humorous that nobody discusses the fact that the shrink has already taped out and will likely be out in two months or just after. This humongous chip was only released so that when AMD releases in the next few weeks they will be behind still in single GPU cards. This is basically what Intel does to AMD every time AMD has a better chip. For all intents and purposes this is a PAPER release of what will come in 2-2.5 months (In Intel's case they just show you what will be out 6 months from now, and a large portion of people don't buy an AMD because Intel might be ahead by xmas...LOL - works like a charm every time AMD is ahead). THE DIE SHRUNK CHIP! Most likely with faster speeds. I suspect they'll come with "ULTRA" version first (and stick it on top of the price heap, so as to not kill all FAT cards in the channel already) and then filter down as these big suckers leave the channel. That's if they even plan to sell more than a few of these to begin withat 65nm. It's only out there so AMD won't look any good in two weeks.